A police officer cleared of killing Ian Tomlinson at London's G20 protests has been sacked with immediate effect after being found guilty of gross misconduct. PC Simon Harwood was earlier found guilty of breaching standards by a Metropolitan police disciplinary panel. But the panel decided it will not consider whether or not the officer's actions caused or contributed to Mr Tomlinson's death in 2009. 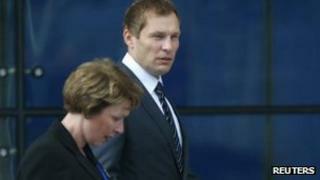 Mr Tomlinson's widow walked out of the hearing, calling it a "whitewash". Deputy Assistant Commissioner Maxine de Brunner said the actions of PC Harwood "fell well below" the usual standards of behaviour for Metropolitan Police public order officers, and revealed the force had offered damages to the family of Mr Tomlinson, the details of which are confidential. She added: "Today's hearing has resulted in the maximum penalty that was ever available to the panel, dismissal due to gross misconduct. That leaves no ambiguity as to how the Met views the actions of Simon Harwood". Ms de Brunner confirmed PC Harwood would keep his police pension as he had not been convicted of a criminal offence. Commander Julian Bennett, chairman of the panel, said PC Harwood's actions "have discredited the police service and undermined public confidence in it". He added: "He has accepted it will be impossible for him to ever again serve as a police officer. We agree, as we consider it inconceivable that he could ever hold a role within the police service again." Media captionMr Tomlinson's stepson, Paul King: "It's been a cover up from day one"
James Lewis QC, for the Metropolitan Police, told the hearing PC Harwood's behaviour was "utterly unacceptable for the police service and completely justifies his immediate dismissal". Members of the Tomlinson family left the hearing before the final ruling, saying the panel's decision was proof of "a cover-up from day one". Paul King, Mr Tomlinson's stepson, told reporters his family would continue its fight for someone to admit liability for his death. "The conflicting evidence from the inquest and the criminal courts is still to be resolved. We ain't going to give up yet. We'll now take this to a civil court where we'll try and find final judgements on who killed Ian," Mr King added. The family's lawyer said that they may consider a judicial review of misconduct panel decision, but would prefer to pursue a civil case to get a judgment of responsibility. PC Harwood hit the 47-year-old newspaper vendor with a baton and pushed him to the ground during the protests in the City of London in April 2009. Mr Tomlinson collapsed and died minutes later. 4 April: Police say post-mortem examination show he died of "natural causes"
An inquest in May ruled he had been unlawfully killed. PC Harwood, of south London, was later acquitted of manslaughter, which he had denied. Monday's hearing was told PC Harwood had twice offered to resign from the Met over the incident. But an officer who is suspended can only leave the force with the approval of the deputy commissioner. After his acquittal in July, the Independent Police Complaints Commission (IPCC) ruled PC Harwood should face the internal Metropolitan Police disciplinary proceedings in public - a first for Scotland Yard. During Monday's hearing, PC Harwood admitted two of the three allegations against him. He accepted that he struck Mr Tomlinson on his left thigh with his baton, and that he pushed Mr Tomlinson so that he fell to the ground. His counsel Patrick Gibbs QC said: "PC Harwood does indeed accept that the discredit which his actions, and the way in which they have been reported, has brought upon the Metropolitan Police Service amounts to gross misconduct." Mr Gibbs went on: "If he had known then what he now knows about the circumstances, everybody's movements and Mr Tomlinson's health, he would have used no force, let alone the force that he did use." However, the officer did not admit his actions caused or contributed to Mr Tomlinson's death. The panel decided it was not necessary to consider this allegation because the threshold of gross misconduct had been reached. It found PC Harwood had breached standards over discreditable conduct, use of force and authority, and respect and courtesy. Mr Gibbs told the hearing the officer accepted that it was "impossible for him ever again to be employed as a police officer". The disciplinary hearing was held at Empress State Building, at Earls Court, west London, and was overseen by a panel of three people, including a lay person and a senior officer. Media captionAssistant Deputy Commissioner Maxine de Brunner: "Today's hearing has resulted in the maximum penalty"
Father-of-nine Mr Tomlinson - a heavy drinker who had slept rough for a number of years - walked 75 yards before he collapsed and died near the Royal Exchange Buildings. In July, PC Harwood denied manslaughter on the grounds that he used reasonable force, and was found not guilty following a trial. During the case the police officer accepted he was "wrong" to have hit and pushed Mr Tomlinson. It also emerged during Mr Tomlinson's inquest that PC Harwood had faced a series of allegations, including unlawful arrest, abuse of authority and discreditable conduct after being involved in what was described as a "road rage" incident while he was off-duty. PC Harwood was allowed to retire on medical grounds in 2001 before a disciplinary hearing over that incident took place. However, the officer rejoined the Met in late 2004 as part of its territorial support group specialising in public order. Scotland Yard's vetting unit had considered the road rage incident, but had not reviewed the full file. IPCC deputy chairwoman Deborah Glass said: "This situation may never have arisen had concerns about PC Harwood's previous conduct been dealt with properly, by his superiors and those who re-employed him.